Dish with the "Beautiful Camilla"
Description Represented in three-quarter profile, this depiction of a young woman does not appear to have the idiosyncrasies of an actual portrait but is rather an idealized image of a “Belle Donne” (beautiful woman), a woman painted according to Renaissance ideals of female beauty. 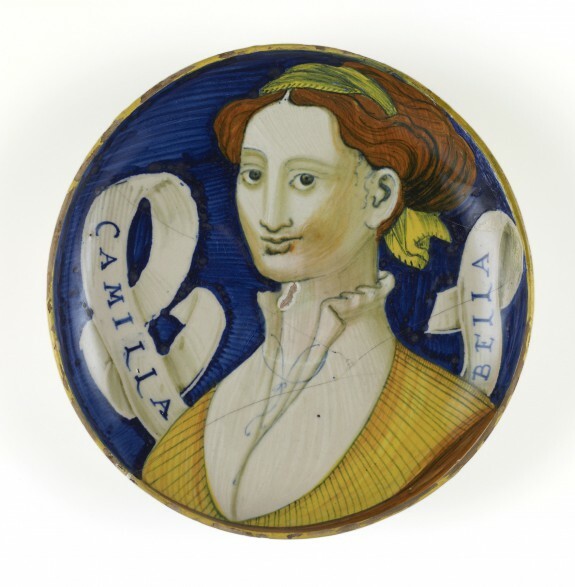 Behind her, a scroll is inscribed with the phrase, “Camilla Bella,” meaning “Beautiful Camilla.” This dish is characteristic of Renaissance “coppe amatorie” (love dishes), that often included an idealized picture of a woman with her name, followed by the word “bella” (beautiful). This dish may have been presented to a lady named Camilla, from her male admirer, or the woman and the inscription could allude to a literary figure, such as Camilla from the Roman poet Virgil’s (70-15 BCE) “Aeneid.” Dishes decorated with busts of beautiful women were extremely popular in the early sixteenth century, and were produced in great quantities in Deruta and Urbino. The back of this dish is painted bluish-white. For similar dishes, see 48.1351 and 48.1741; for more information on ‘maiolica’ in general, see 48.1336.